“Sitting is the new smoking,” they say. Since I already have type 1 diabetes, I don’t need extra health risk factors. My PhD is in Human Factors, a field that include ergonomics, so I have been familiar with the idea of standing desks for a while. About 10 years ago, I decided to try a standing desk for a while to see how I liked it. As a grad student, I didn’t have extra money to buy a fancy desk, so I used an Ikea hack: I had an Ivar shelf so I put my monitor on a shelf at standing height and added a keyboard shelf beneath — an option that was available back when people used keyboards. I can’t know exactly what, if any, health impact this had for me. For whatever it is worth, in my n of 1 experiment, despite having type 1 diabetes for 32 years, I have no end organ damage. How much this one habit played into my fortunate state of doing-ok-so-far, I do not know. I wanted to put this post out there because I see more and more articles about how we shouldn’t be sitting to work. I think the message of these articles is good, but many of them link to expensive standing desks, which not everyone can afford. 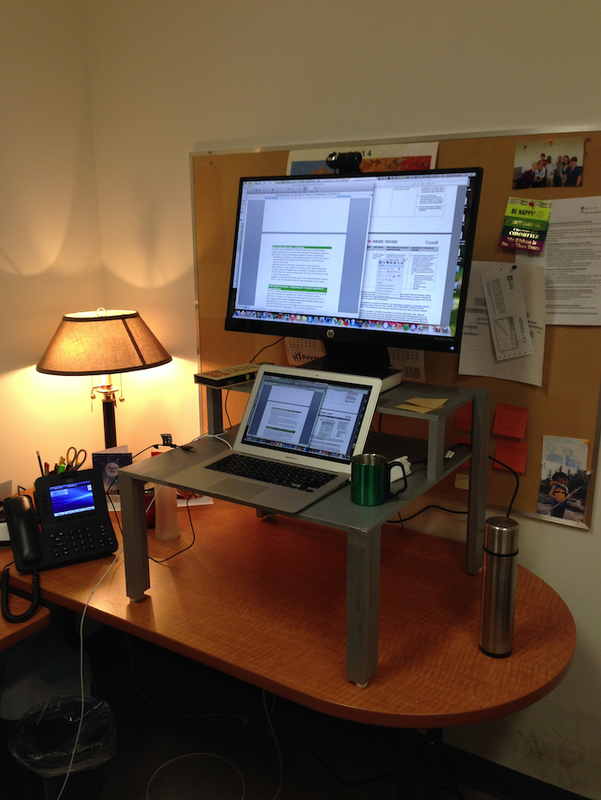 If you want a standing desk but don’t have hundreds or thousands of dollars to spend, you may have other options. Unless your height changes a great deal from day to day, you can use anything that will raise the screen and keyboard to the right height. I did not bother trying to put a fancy desk through purchasing at work, I just brought the DIY (do it yourself) stand pictured above from home. It is made of plywood and scrap wood painted a silvery-grey to match with the colour scheme in our offices. It has rubber feet so as to not damage the desk. When I switched from one large screen to another, the screen height was no longer quite right so I put a book under the new screen. Not everyone can adapt their own working space, unfortunately. However, for those who do have some flexibility, you don’t have to come up with hundreds or thousands of dollars for a whole new desk. If you want to stand to work, consider just putting something under your current setup to raise it to the right height for you. Like my work desk, I have a similar setup at home. My husband uses a metal shelving unit in his office. If you can’t make something like this, you might try a sturdy box at least for a while to see how you like standing to work.